Today’s snickerdoodle sandwich cookies left me with about a cup and a half of vanilla cream filling, and I could think of nothing better to do with it than to pipe it into some dark chocolate cupcakes, Hostess-style. You remember the Hostess cupcake…dark chocolate cake, fluffy filling, waxy (in a good way) chocolate icing and that signature white loopy swirl. I actually preferred the orange version to the chocolate version, but both were quite a treat. These cupcakes are a take on the classic store-bought version, minus the white loopy swirl (though I really want to do that next time). Mike proclaimed them better than the Hostess version, without intending any offense to the fine folks of Hostess, of course. Bake cupcakes and allow to cool completely before filling and frosting. Make filling; reserve leftover portion for another use. Fill a pastry bag fitted with a 1/4 inch plain tip with about 1 1/2 cups filling. Insert the tip into each cupcake, piping in filling until the top of the cupcake starts to puff up. Prepare icing; using a teaspoon from your flatware, scoop about 1 teaspoon of filling onto each cupcake and quickly frost with a small offset spatula. Store cupcakes in an airtight container at room temperature for up to 3 days. Makes 15. You know how sometimes you have a chocolate peanut butter dessert and it’s not at all what you wanted it to be? The chocolate is too bitter or sweet, the peanut butter is too sweet or salty, one flavor overpowers the other, or the whole thing is just too heavy and rich? This is not one of those desserts. 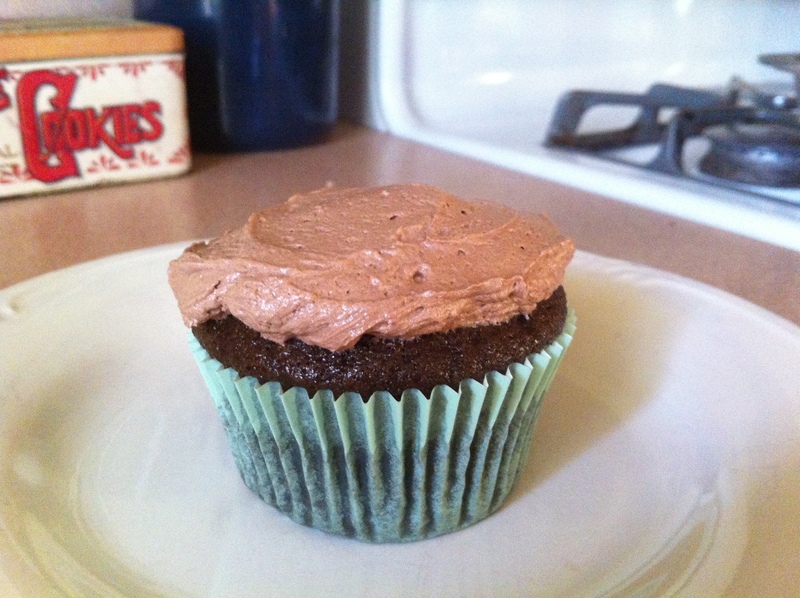 This, my friends, is the most delicious combination of chocolate cupcakes and peanut butter frosting I’ve ever made. The cupcakes, originally from the Nestlé Very Best Baking blog, offer a tender texture and smooth chocolate flavor, while the frosting is just sweet, salty, and peanut buttery enough. If left to my own devices, I could have eaten the entire batch. *I actually use Nestlé baking cocoa and find that sifting it into the flour yields a more even texture, although the original recipe did not call for sifted cocoa. Preheat oven to 350 degrees. Line two 12-count cupcake pans with paper liners; this recipe makes 24 cupcakes. In a medium bowl, combine flour, cocoa powder, baking soda, and salt; set aside. In a mixing bowl, cream together butter and sugar until fluffy. Add eggs, one at a time, beating well after each, then beat in vanilla extract. Add flour mixture and milk in three alternate batches, beginning and ending with the flour and scraping the sides of your bowl well, beating until smooth. Using a 2-inch cookie scoop, drop scoops of batter into cupcake wells. Bake for 18-20 minutes, until a cake tester comes out clean. Remove from oven and immediately remove cupcakes from pans, cooling completely on a wire rack. To make the frosting, beat butter and peanut butter on medium speed for about 3 minutes; mixture will be slightly lumpy. Scrape down the bowl and add powdered sugar, 1 cup at a time, beating well between each addition. Add 1 tablespoon milk, then beat for 1 minute; if frosting is too thick, add another 1 tablespoon milk to think it out and beat for another 2-3 minutes until very light and fluffy, scraping the bowl well a few times. You want a fluffy texture that will be easy to pipe. Fit a large piping bag with the tip of your choice; I used a Wilton 1A, which requires a 14-inch pastry bag and large coupler set. Pipe frosting onto cupcakes in generous swirls or blobs. Store at room temperature for up to 3 days. 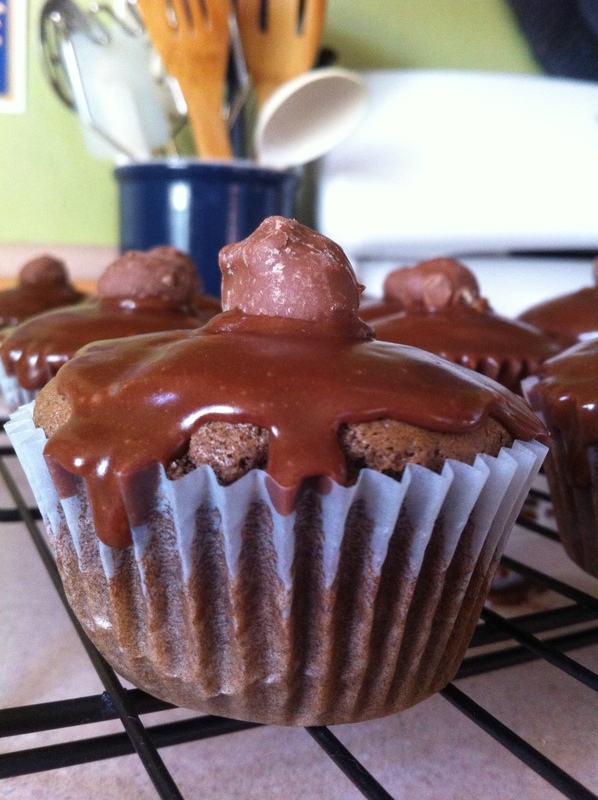 A while ago I made chocolate peanut butter cupcakes, which were inspired by the chocolate-covered peanut. They were delicious, but I always thought they needed more peanut butter filling and a few tweaks to meet my desired chocolate/peanut butter balance. After a bit of thinking, I came up with this: the buckeye cupcake. These treats use a basic chocolate cupcake recipe from my Better Homes & Gardens baking book, then get hollowed out and stuffed with peanut butter filling and topped with a cocoa frosting. In the future, I might use a chocolate buttercream instead – while they are delicious, they’re still not exactly what I’m after. And this, friends, is the beauty of baking…you can keep adjusting your recipe until you get exactly what you want! For the cupcakes, allow butter and eggs to sit at room temperature for 30 minutes. Preheat oven to 350 degrees. Line two cupcake tins with paper liners; this recipe makes 3 dozen cupcakes, so you’ll need to re-use one tin for your last batch. In a large bowl, combine flour, cocoa powder, baking soda, baking powder, and salt; set aside. In a mixing bowl, beat butter on medium speed for 30 seconds. Add sugar, about 1/4 cup at a time, scraping the bowl often. Once all sugar is added, beat on medium speed for 2 minutes. Add eggs, one at a time, beating well between each addition. Add vanilla extract and beat well. Add flour mixture and milk alternatively in three batches, beating until just combine between each. Once all ingredients are incorporated, beat on medium speed for 20-30 seconds. Fill cupcake wells half full and bake for 18-20 minutes, until a cake tester comes out clean. Cool in pans for 1 minute, then remove cupcakes from pans and cool completely on a wire rack before filling and frosting. Make your filling: in a mixing bowl, beat peanut butter and butter together until smooth. Add powdered sugar slowly, beating well after each addition. Add vanilla, then add milk, 1 tablespoon at a time beating until well-combined. Make your frosting: combine melted butter and cocoa powder, whisking very well until smooth. Place mixture in the bowl of a stand mixer fitted with the paddle attachment and beat on low speed for about 1 minute, then increase speed to medium and beat for 2 minutes more. Add 1 cup powdered sugar and beat on low speed, then add about half of the milk, continuing to beat on low speed, until combined. Follow with another cup powdered sugar and remainder of milk, beating on low until combined. Add remaining powdered sugar, then vanilla, beating until frosting is creamy and spreadable. To assemble your cupcakes: core each cupcake and reserve scraps for another use. Using a one-inch cookie scoop, scoop peanut butter filling into each hole and gently press down with an offset spatula. You’ll have about 1/3 cup of filling left over that you can reserve for another use. Using a one-inch cookie scoop, scoop drops of frosting onto each cupcake and spread with an offset spatula. Happy World Chocolate Day! Let’s celebrate with some buttermilk chocolate cupcakes and cocoa frosting. If you want to add a scoop of vanilla ice cream on the side, that would be a great idea too. Can you imagine a world without chocolate? I can, but I certainly don’t want to. This delicious creation is a culinary wonder, pairing easily with a range of flavors both sweet and savory. When you think about it, I bet you have at least one favorite treat that involves chocolate in some way, even if it’s a basic chocolate chip cookie or a tender chocolate cake. These cupcakes remind me a bit of devil’s food, and the original recipe came from Taste of Home, one of my new favorite sites. I cut that recipe in half to make a dozen and chose to pair them with my favorite cocoa frosting, which uses simple ingredients you’re likely to have in your pantry. You could definitely go with the one in the original recipe, or use a vanilla frosting instead – but given that it’s World Chocolate Day, we’re going to go all-out chocolate. Preheat oven to 375 degrees. Line a 12-well cupcake tin with paper liners. In a small bowl, combine flour, cocoa powder, baking soda, and salt; set aside. In a glass measuring cup, combine buttermilk and water; set aside. In a mixing bowl, cream together butter and sugar until light and fluffy. Add egg and beat until well-combined, then add vanilla extract and beat until well-combined, scraping the sides of the bowl a few times. Add flour mixture and buttermilk/water mixture alternatively in two batches, beating well after each. Using a 2-inch cookie scoop, scoop dough into prepared cupcake wells, filling about 2/3 full. Bake for 18-2o minutes, until a cake tester comes out clean. Remove from oven and cool in the pan for a few minutes (the original recipe suggests 10 minutes, but I cooled mine for about half that time), then remove to a wire rack to cool completely before frosting. For the frosting: in a small bowl, combine melted butter and cocoa powder, whisking until smooth. Place mixture in the bowl of a stand mixer fitted with the paddle attachment; beat on low speed for 1 minute, then on medium speed for 2 minutes. Add 1 cup powdered sugar and 1 tablespoon milk and beat until very well-combined, scraping the sides of the bowl well a few times. Add remaining powdered sugar and 1 more tablespoon milk and beat for about 1 minute; add vanilla and beat 1 minute more, then add final tablespoon of milk and beat for 2 minutes, until lighter in color and fluffy. Fit a piping bag with a large star tip; pipe frosting onto cupcakes. Top with sprinkles if desired; store in an airtight container at room temperature. Have you ever ordered an ultra-chocolatey dessert and regretted it after a few bites, completely overwhelmed by chocolateness? I certainly have. Most restaurants have some manner of “death by chocolate” dessert on their menus, usually involving layers of chocolate cake, mousse, cheesecake, ganache, and so on, and they’re all too overpoweringly chocolatey for me. One of my lovely coworkers asked if I could bake for her son’s 13th birthday this weekend, and the guest of honor requested chocolate cupcakes with chocolate frosting. 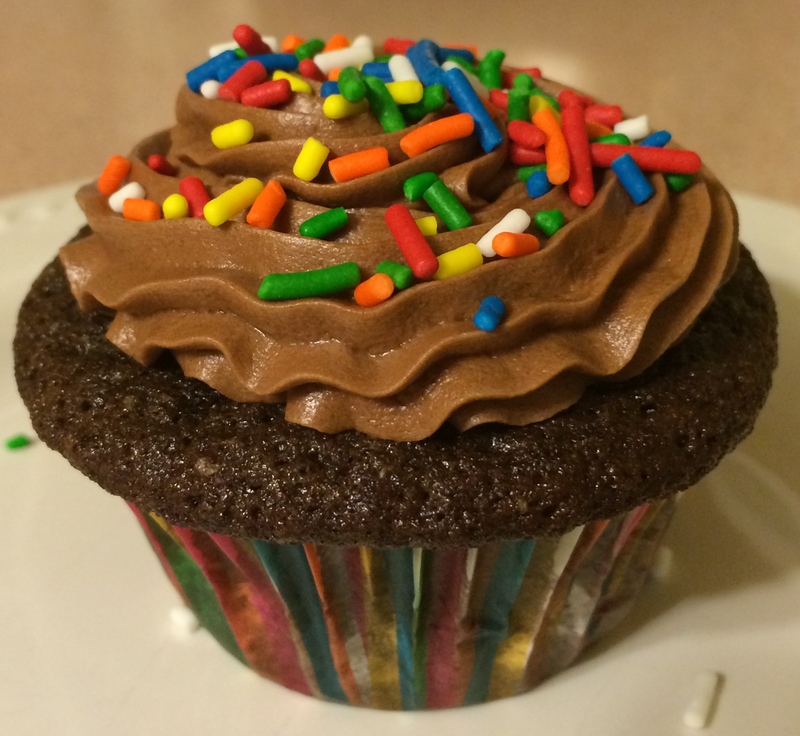 While there are many cupcake and frosting recipes to choose from, I decided to go with a light and dark combination to prevent chocolate overload. The cupcakes themselves are my dark chocolate recipe, while the frosting is chocolate buttercream, light and fluffy and a great complement for a darker cake. Happy Birthday, Theo! Bake cupcakes in full-size cupcake pans; the recipe will yield 24 regular-sized cupcakes and 12 miniature cupcakes, or about 30 regular-sized cupcakes. Allow to cool completely before frosting. Using a one-inch cookie scoop, drop scoops of frosting onto cupcakes. Frost with a small offset spatula. If storing in the refrigerator, bring cupcakes to room temperature before serving; these do not need to be refrigerated, but I’m chilling mine because it’s quite humid in Pittsburgh tonight. In the history of the world, has there ever been a more amazing culinary combination than chocolate and peanut butter? Absolutely not. Granted, these foods are pretty nifty on their own, but putting them together was perhaps one of the best decisions ever made in the kitchen (or in general, for that matter). I think the chocolate-peanut butter combination is such a hit because it has great balance; it’s not too sweet or salty, so you get a bit of both kinds of flavors in one bite. A few months back, several of the gals in my office and I were discussing the merits of the chocolate covered peanut, and the idea for these cupcakes was born. The recipes below are a combination of a chocolate peanut butter cupcake from Woman’s Day and a few other recipes I found online, but I have to admit that my first attempt at icing, using a different recipe, went totally awry. Though it tasted delicious, the consistency was all wrong, so I quickly substituted the chocolate drizzle icing that appears below for the last dozen cupcake that will go with me to the office tomorrow. In a medium bowl, whisk flour, cocoa powder, baking soda, and salt together until well-blended; set aside. In a small bowl, whisk milk and sour cream together until well-blended; set aside. In a mixing bowl, combine butter and sugar; beat on medium speed until light and fluffy. Add peanut butter and beat until well-combined. Add flour mixture and milk mixture alternatively, starting and ending with the flour mixture and beating until just combined. Scrape sides of the bowl often. Using a two-inch cookie scoop, scoop batter into prepared cupcake pans. Bake for 18-20 minutes, until a cake tester comes out clean. Cool completely before filling and icing. Note: I added more peanut butter to suit my preference, hence the “about 3 tablespoons” above. You can certainly just stick with the 1/2 cup if you like, but I found that additional peanut butter enhanced the filling flavor. In a mixing bowl, beat peanut butter and butter together until smooth. Add milk, 1 tablespoon at a time, beating until well-combined. Fit a piping bag with a 1/4 inch plain tip; insert tip into the top of each cupcake and inject the filling. Stop when the top of the cupcake begins to bulge, as you don’t want it to explode! In a medium saucepan, melt butter over low heat. Stir in cocoa powder, then remove from heat. Add powdered sugar, vanilla, and milk and stir well until you reach a very smooth, drizzle consistency. Using the teaspoon from your measuring spoons, scoop out 1 teaspoon of drizzle icing and spoon over each cupcake, spreading slightly to coat the entire top. Gently press one chocolate covered peanut into the center of each cupcake; allow icing to harden before serving.